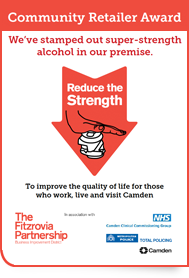 RTS is commissioned by The Community Safety Partnership in Camden Council. Our main partners include both the Metropolitan Police and British Transport Police, Camden Council’s Community Presence Officers (CPOs), Focus – Camden’s mental health outreach team, The Spectrum Day Centre, Women at the Well women’s centre, and a wide variety of hostels and accommodation providers, including St Mungos Broadway, The Single Homeless Project, Centrepoint, One Housing Group and Irish Centre Housing. Change Grow Live, our parent organiszation, is commissioned to provide Camden’s drug services; The 184 Project, Camden Community Drug Service Kilburn Hub, The Camden Drug Intervention Programme, as well as The Camden Alcohol Service and we work closely with all of these services to ensure that our clients with substance misuse problems get the best treatment possible. We work closely with homeless outreach services in other boroughs in order to find accommodation for our clients and facilitate supported reconnections. Whilst we have a Polish speaker on our team we also work with Routes Home, who arrange for Central and Eastern Europeans to have supported reconnections to their native countries. Change Grow Live operates an equal opportunities policy. This is to ensure that our service users, employees, volunteers and peer mentors do not suffer discrimination on the basis of racial, ethnic or national origin, gender, marital status, disability, sexual orientation, age, religion, health status, or previous criminal convictions. Camden RTS encourages job applicants and volunteers from a diverse background in order to reflect the diversity of our client group.